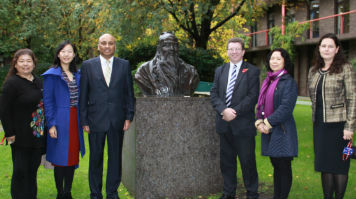 London South Bank University's (LSBU) Confucius Institute for Traditional Chinese Medicine (CITCM) proudly hosted VIP guests from the House of Commons this week, to promote their work with local schools and communities. Gerry Sutcliffe MP, Chair of the All Party Parliamentary Sports Group, and Mark Hendrick MP, Vice Chair of the All Party Parliamentary China Group, were introduced to the history and achievements of the CITCM by Lara Martin, Deputy Director of the Institute. They were also shown how the CITCM promotes wellbeing through forms of martial arts and Taiji in schools and the local community. This community work follows an invitation from Gerry Sutcliffe MP, which encouraged the CITCM and LSBU to contribute ideas on how to promote sports, incorporating well-being and sports exercises within schools and local communities, following the successful 2008 Beijing Olympics and 2012 London Olympics. Both MPs were pleased with the achievements of the CITCM when they visited. Find out more about the Confucius Institute for Traditional Chinese Medicine.